Before you ask, yup, this was based on the PV for Luka's double lariat. Drew it myself. As a follow-up to my other Hatsune Miku blog post, I thought I'd talk a bit more about why I like Miku so much. Aside from her character design, which is definitely a plus for me. I'm a big fan of Miku's music, but I never really realized how much I liked her songs until I started playing Hatsune Miku: Project Diva for the PSP when it was first released. I have to admit that I sucked big time at that game when I first played it. I was so bad at it that I was actually failing the first song, "World Is Mine" on easy. Of course, once I realized that music games are as much about using your ears as they are about using your eyes, I got much better at the game. In fact, I'm at least able to get an excellent on most songs in Extreme in Project Diva f right now and going for normal and hard perfects on 4-star songs (which don't really reflect the actual difficulty level of the song) without combo guards in Project Diva F 2nd. Of course, I'm not here to talk about the development of my rhythm game skills. 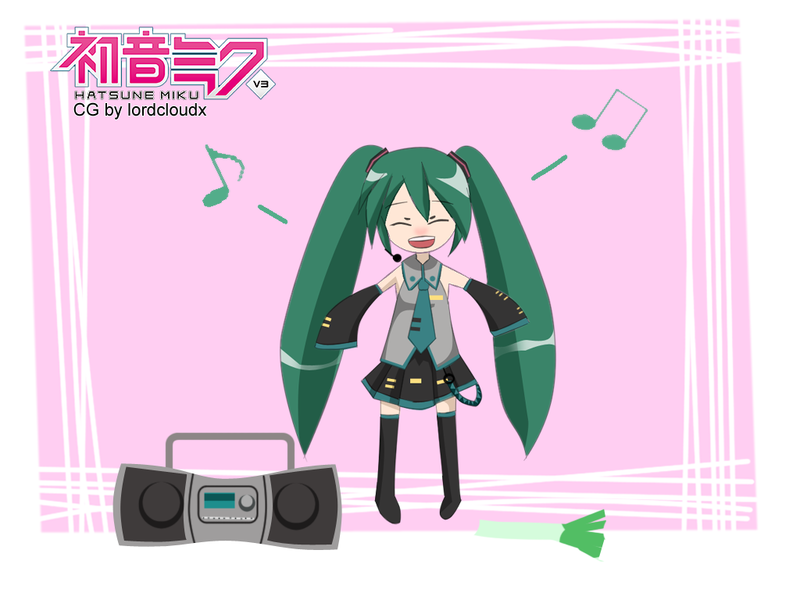 You see, as I continued to play the first Project Diva game, I began to realize something: I really, really like vocaloid music -- the songs composed for Miku in particular. This was when my obsession with Miku and vocaloids in general really took off. One reason that I really like vocaloid music is that it actually takes the spotlight away from the singer in particular and empowers the musician, composer, director, artist, and other people behind the production in general. I don't like all vocaloid music and my favorite songs are mostly from 40mP, DorikoP and Ryo, all big names in the realm of vocaloid music, but I find that this quite different from liking music from a boy band, or Justin Bieber, or some American Idol winner/finalist for example. I've personally always found one particular practice that popular reality TV singing shows have advocated to be a tad disrespectful to the original composers of these songs; the singer shouldn't be trying to "make the song his/her own," because the original composition never belonged to them in the first place -- unless they made the song themselves. In contrast, in a vocaloid song, Miku will never use "voice dynamics" or any form of "vocal acrobatics" in order to "make the song her own." There is nothing that goes into a vocaloid song that the original composer didn't intend to be in the song in the first place -- including the voice, which was also sequenced and tuned by the original composer. I just feel that this makes the song more "pure" and germane to the actual intent of the composer than one which is sung with the singer's own "interpretation" of the song, no matter how artsy and "performance-level" the singer might make it seem. Naturally, I write this from the perspective of a fan and not that of a musician -- which admittedly, I am not by any stretch of the imagination. With that said, here are some more of my recent favorite Miku songs. I particularly like the parts where her voice goes up here. The song also has a very anime-like feel to it, which I feel are the kinds of songs that Miku's voice is best suited for. It kind of reminds me of some of the BGM from Touhou games. A friend said it sounds epic-rockish ala songs from 403 forbidenna and Dragonforce -- which it does. Thanks, kik. 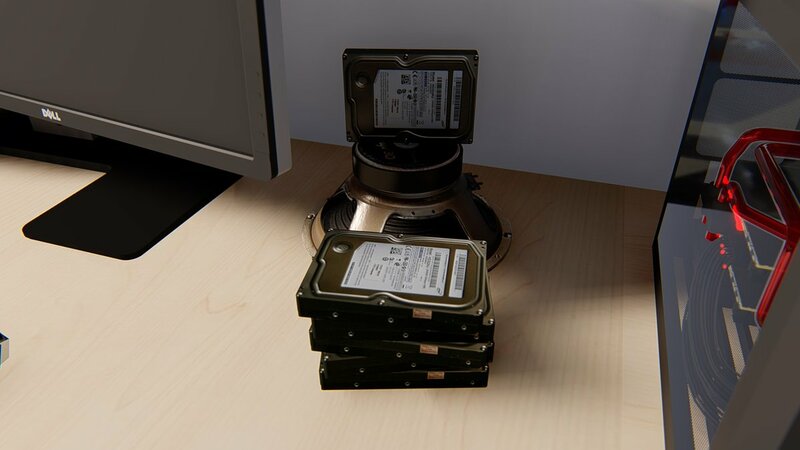 Naturally, I'd choose another 40mP song. This is a new one that's been translated and subtitled by descentsubs on youtube. There's always something kind of sentimental and a bit melancholic about 40mP's songs -- even something as seemingly light-hearted as this one. This style just sits well with me. A cute song in its own right, but the real reason that I like this is because of the translated lyrics together with the awesome PV. Sniffle... my friend was good at drawing, ok? Translation and subtitles provided by vgperson on youtube. Finally, to wrap up this post, a Miku classic, Ai Kotoba. This songs just feels "so Miku" for me. Cute, innocent, perky, but with lyrics that are a bit sentimental and with an aesthetically pleasing tune over-all. She gets the cover art, but has nothing to do with the contents of this chapter -- typical. Synopsis: We start with a flashback to an incident some time ago. It seems Aika tries to return her King’s Jewel, but she is asked by Mikado to literally throw her stone at Athena. On May 7 in the current year, Aika does as asked and Athena effortlessly catches it, just as Mikado predicted. She notices that Midas’ curse on the King’s Jewel has been lifted and gives the Jewel to Machina and tells him to take it far away. Just as Aika turns away to leave however, she is surprised by some kind of noise. She turns back at Athena and discovers that she’s shrunk. Aika and the miniaturized Athena go to confront Mikado. At this point, Athena states that this is the curse of the King’s Jewel and she and Mikado engage in a discussion about the powers of the King’s Jewel leaving Aika completely out of the conversation. It seems that those who use the royal power can never use it again, thus, getting touched by the light of the King’s Jewels will result in them getting cursed – reverting their age and memories to the time just after they used the power. When Aika tries to cut in, both Athena and Mikado respond that they’re just discussing what to eat for dinner using code – which is a blatant lie, of course. When Mikado asks Aika where the stone is, she lies by saying that it was lost. Athena deduces that Mikado wanted to use her for something that requires no interference from her future self. She speaks with Aika and believes that Mikado probably won’t return her to normal soon, so she hatches her own plan of action to return herself to normal for a few seconds. Aika suggests just hitting him until he gives in – to which Athena declines. Basically, her goal is to find out what Mikado really wants and to do this, she’ll need to speak with Aika as her teenage self and to have the situation explained to her. End of the flashback, we return to the current timeline in August 17, Ikusa and Alice (Mini Athena, really) on Murder Island. She finally presses the power button on her battery meter and to everyone’s surprise (knowing Hata), she really does return to normal, wearing her trademark black dress and all. Ikusa nonchalantly asks where her dress came from and she goes “I don’t want to hear that from you,” especially considering that Ikusa’s cloak came from out of nowhere as well. Anyway, that ends the chapter. Review: Lots of interesting stuff happening in this chapter. 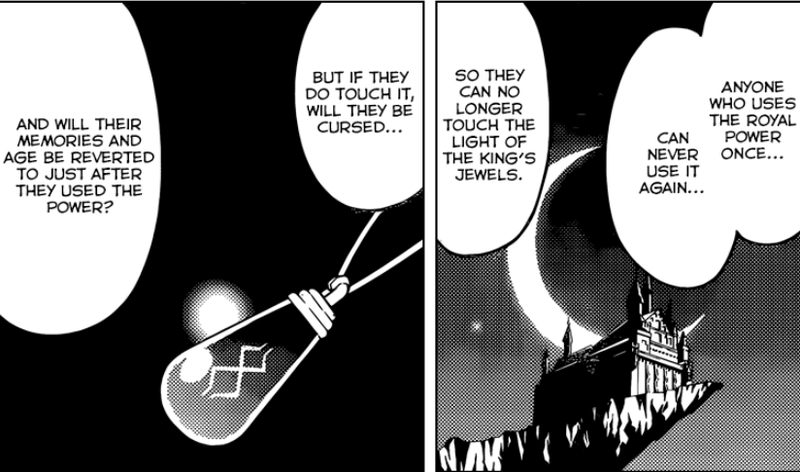 Not the least of which is that we learn a little bit more about the King’s Jewels after several hundred chapters. We finally learn how Athena was cursed into her current form and how her little battery meter works. It’s implied that Athena used the Royal Power already, but exactly when is still open for debate, methinks. The only thing we can be certain of is that it was when she was much younger, thus resulting in her “Alice” form. Furthermore, there can be no more room for speculation now that Alice is indeed Athena. What I find interesting in this chapter is that Athena isn’t just blindly playing along with Mikado’s “evil chessmaster” schemes and in fact, hatches a counter-strategy of her own – even if it’s just to try and find out what the old man is really after. Also, we finally have a clear idea of where we are in the current timeline. The 17th of August. Note that September should be Can’t Take My Eyes Off You Territory and there should be a little Leeway for the events of Heaven Is A Place On Earth. Thus, there are only a few days to conclude this current arc – but it seems Hata is developing the plot at a rather faster pace than usual for this current arc anyway. The eventual outcome would probably be Hayate finally acquiring a King’s Jewel allowing Nagi to return to her Mansion and millionaire heiress lifestyle. Speculation corner: At this point, I’m not sure if anything will really come out of the foreshadowed Hina confession given that the main King’s Jewel plot has begun to move again with this arc. We have seen how Hata can manage several ongoing plot threads at once and somehow make them flow together, but I’m thinking it would be a bit difficult to continue with the Hina confession – which would probably require a longer string of chapters and also continue with Ikusa, Athena and the King’s Jewel storyline. 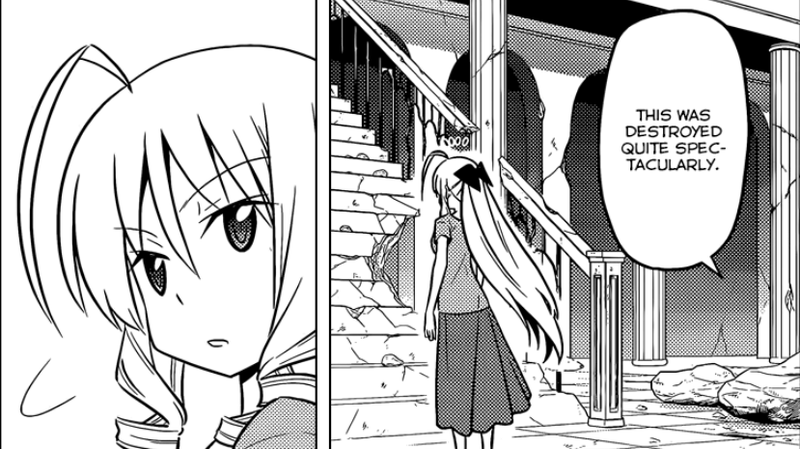 Thus, I’m going to speculate that it’s going to be postponed indefinitely again, or Hayate will just pussyfoot his way around the confession as usual. Of course, it could also happen the other way around and the King’s Jewel storyline could once again be set to the sidelines as Hina and Hayate take center stage for a few chapters. After all, a lot can happen in a day in this manga. On other things, I find it strange that Athena mentioned that she would speak with Aika as her normal self, but it seems that she’s going to use the few seconds that she apparently has to speak with Ikusa instead. This leads me to believe that perhaps she’s already spoken with Aika and accomplished part of her plans and that there’s more than one method to recharge her powers other than being near the Shirousakura, which is currently with Hina. Of course, it might not be as convoluted as that, it just might be (based on a twitter exchange with DoughnutGunso) that meeting with Ikusa again is just so important to her, that she’s decided to use her time to speak with him instead. 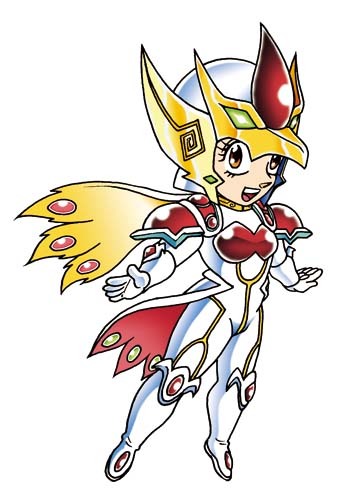 Edit: One thing I remember is that Athena also appeared in her adult form before Hayate once before she made her first appearance as Alice the next day. She did mention that she'd try a few things to get her original form back. Maybe there are multiple ways to do this, but each method can only be used once. Furthermore, regarding her scheme to try and put Hayate and Hina in danger, it's possible that she doesn't want to put them in any real danger, but she does want to put Hina under enough stress for her to pull out and use the Shirousakura -- since that might result in a longer reversion to her normal form when that happens. By the way, Nagi hasn’t made an appearance for a few chapters now. Iyam disappoint. Here, have some fanart… make it happen, Ayasaki! Say it, Ayasaki! Say it! 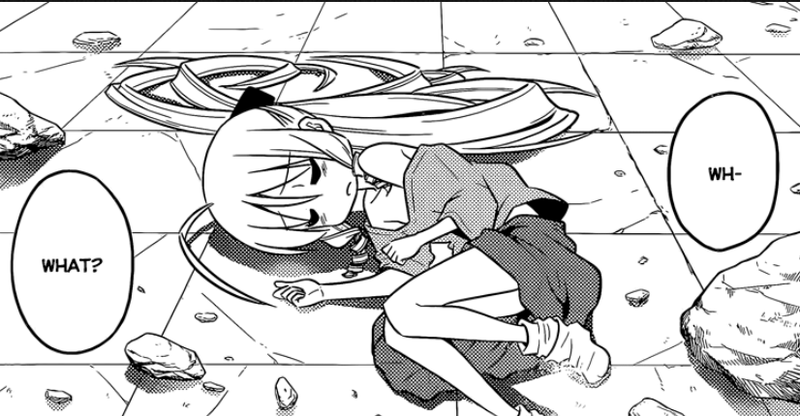 No new chapter for Hayate no Gotoku! this week, so I thought I'd do some fanart. This one was inspired by a similarly styled piece of fanart that I came across on some online image board. Let me explain the premise of the pic a bit. Basically, I just realized that as a self-proclaimed Nagi x Hayate shipper, I haven't really done that much fanart shipping these two together -- so I simply had to remedy that and in a hurry! 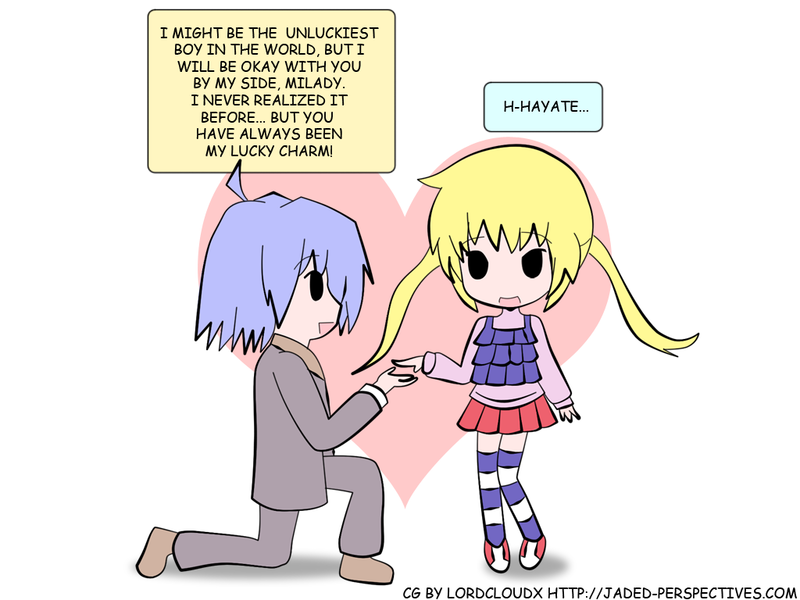 I was thinking of a proposal from Hayate as the theme, since I'm pretty sure that's what most of us on the ojou-sama ship want to happen because Hayate has never really openly reciprocated Nagi's feelings for him. I can understand why Hata would delay this inevitability (lol :P) since it would mean "game over" for all the other ships if this does happen and he can't really afford to do that unless we're very near the end of the series since those other seafaring vessels are helping to keep the main one afloat after all. 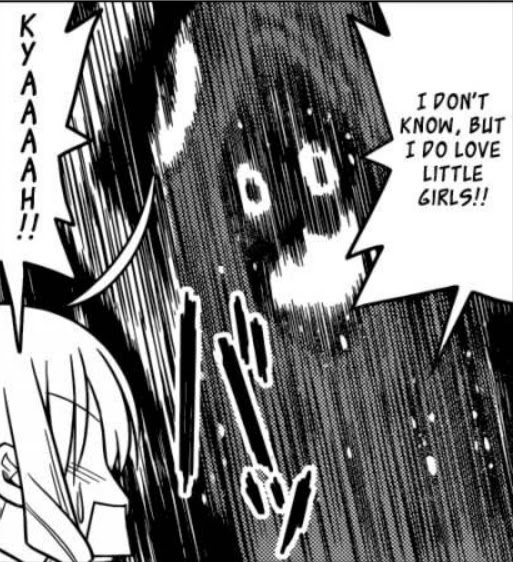 In any case, It entered my mind that one angle of the manga that has been largely understated due to the lack of vocal expression by many of us in the Nagi fanbase and the abundance of vocal individuals (and population) from the other seafaring vessels who are more than happy to understate anything positive that happens in favor of our little blonde ojou-sama, is that little Nagi is very lucky. So I thought: "Extremely unlucky boy together with extremely lucky girl -- sounds like a good match for me." Note that I'm not even implying in the slightest that this is the only thing that this pairing has going for it (I've already discussed that elsewhere in this blog), but it was the theme that I eventually came up with for this particular fanart. 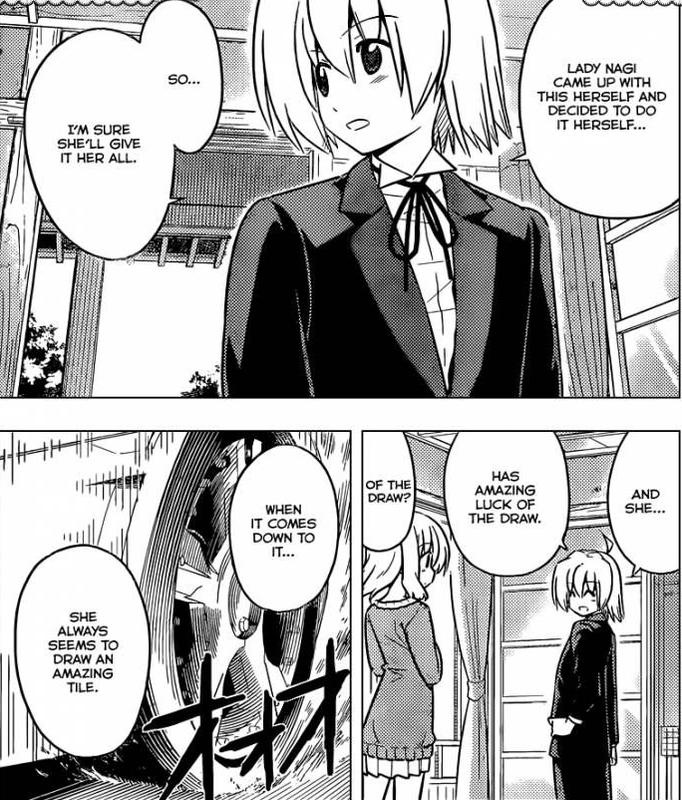 It's been my personal observation since I started reading this manga last year (over and over again) that Hayate's bad luck actually started to change when he first met Nagi. Ever since he met her, he has generally been living a much better life than he ever was with his douchebag parents and while his bad luck might still haunt him every once in a while, it has never done so again in a way that makes him miserable like when he was with his parents. So anyway, I thought... yeah, why not have him call Nagi his lucky charm? By the way, note that the dialogue I've chosen to include in this particular fanart is actually quite open to sarcasm -- especially for those from other ships, or for irrational Nagi haters in general. So go ahead and hit me with those sarcastic comments you've got brewing in your head... if you don't I'll make something up myself within 3 days from making this post. See ya on Wednesday! Sarcastic Comment #2: They sure do look good together... as SIBLINGS! ...and I'm out of ammo. 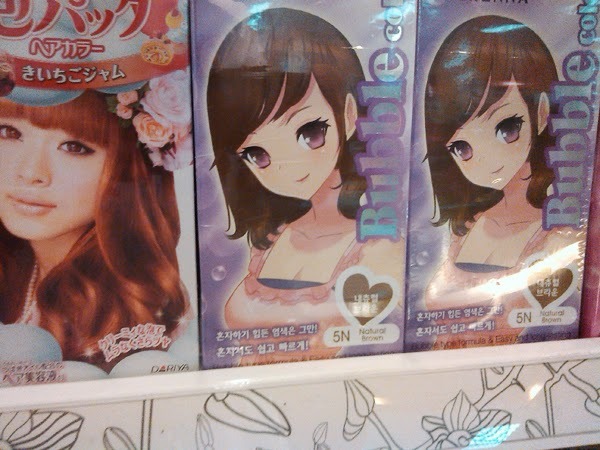 By the way, I saw this really cute art style on some hair dye products being sold here. I might make a (lol) pastiche of this using Nagi as the subject this weekend. Synopsis: The Hakuo baka-trio (Izumi, Risa, Miki) are arguing over their little video koushien thing (Hata does not forget even the silliest plot threads) and Risa and Miki use it as an opportunity to harass Izumi saying that there’ll be a “flesh-colored punishment” awaiting the loser. Izumi is all confident that both of them didn’t make any noteworthy videos anyway, but she is surprised when both of them turn up with award-winning documentaries coz y’know, they’re filthy rich and are willing to put in a whole lot of effort just to harass Izumi. Athena: I'm like sooo ready to confront a murderer. Izumi’s in a pinch so she comes up with this idea of filming footage of a fish in an aquarium using a fixed camera and watching it grow every day. Kotetsu points out that it won’t work out because fish don’t grow that easily and she’ll need to put some real effort into taking care of it. Somehow the conversation moves to equating growing fast with “promotions,” so Izumi asks her father to give her something for promotions and she returns with a bottle of Remy Martin, for whatever that’s worth. She then feeds it to the fish – who starts growing human arms. She and Kotetsu are freaked out at first, but she decides that this will make an excellent film, so she feeds it some more until it suddenly climbs out of the tank with human arms and legs and some kind of face inside its mouth. It grabs her and tells her that it can’t take any more of that food before running away. Athena: Yikes! But not a pedo! Back to Athena… or little Alice if you prefer, who is still all smug thinking Mr. Murderer has finally come and she’s all ready to confront him. But when she turns to face him, it’s actually the fish monster that Izumi had created and she goes all “who the **** are you?” To which, the fish monster responds quite appropriately with “I dunno, but I like little girls!” Good job, Fish… from now on, your new name is Pedofish. Pedofish: Welcome to MY world. Athena freaks out at pedofish but Ikusa arrives in the nick of time and effortlessly knocks Pedofish to the moon. He then goes, “I’m too cool for a name.” Athena then clicks on her battery meter thing and says that it’s been ten years since she last heard that line. Review: Looks like Hata’s decided to finish up some plot threads from the doujinshi arc this time and connect it with the new arc by wrapping up this video koushien thing quickly. Is this a sign that the end is near? I guess it could be, eh? I was pretty amused when Athena’s smug demeanor was broken with the revelation of Pedofish, who wasn’t who she was expecting him to be. She’s all ready to confront a murderer, but not a fish monster who happens to like little girls. LOL! Ikusa: Even the back of my head is too cool for you! Furthermore, there’s that scene with Wataru and Saki wherein Wataru finally gives up on Isumi and makes it a point to say “I loved you” in a parallelism to Hayate’s “I loved you” at the end of Athena’s arc. 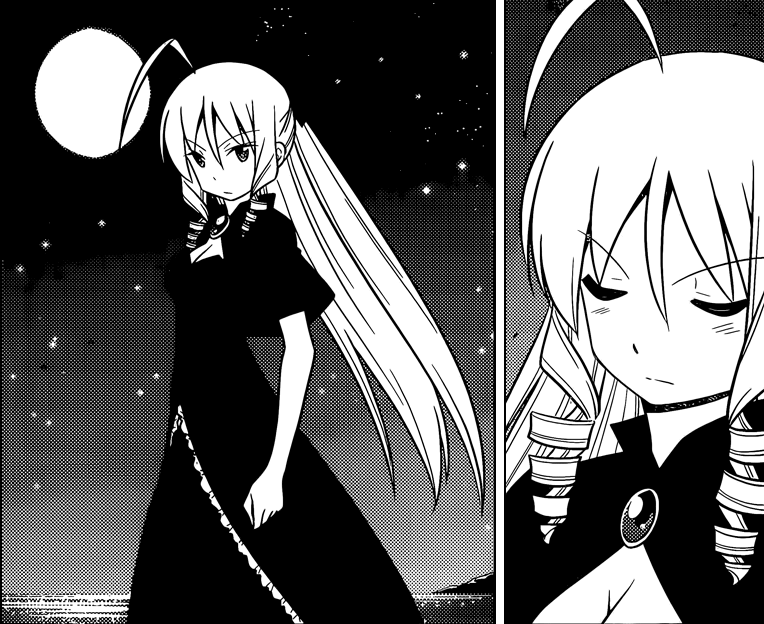 Feelings, schmeelings, Hayate and Athena parted ways at the end of Golden Week and Athena entrusted Hayate to Nagi. Meanwhile, Hayate’s still too emotionally evasive to come to terms with his own feelings so I won’t pretend to know how he really feels. In any case, why cling on to that little addendum (I might not return it next time) that seemed more like an afterthought? Sorry guys, but as far as this biased blogger is concerned, all roads point to Ikusa x Athena. Of course, you can always cling to the "age-gap clause," but really, how old is Athena, really? 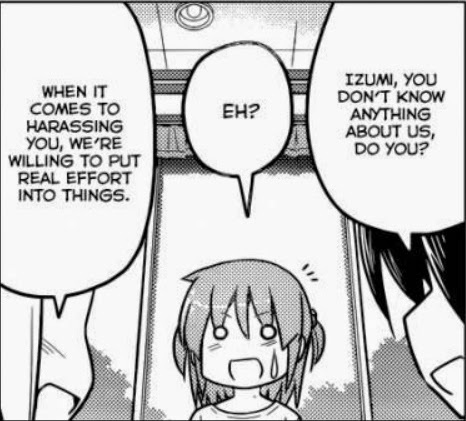 She sure acted pretty mature for a toddler back then and Hata doesn't seem like the type of Author to care for age-based biases... or at least knows how to manage workarounds to it. Also, it would be fair to speculate that Ikusa might not have lost his memories after all, but has some other “epically heroic” reason for not disclosing this to Hayate and company. Synopsis: Yukiji spends her million yen summer bonus on lottery tickets and got absolutely nothing for it. We flash back to a scene where Yukiji is asking Aika for advice on how to get rich inside the Hakuo student council room. Aika explains that the very basics of economics is that “you lose the money that you spend.” Anywayz, Yukiji says that she’ll find the richest man in the world and ask him instead. Aika tells her that it’s someone named Warren Buffett, the world’s #1 investor who’s written a whole lot of books. We get a little trivia on him courtesy of Aika. At the end of the little autobiographical economics lesson, Yukiji decides that she’ll be an investor. She pulls out some kind of book on Security Analysis and proclaims that she’ll learn how to get rich by reading it, but it turns out it’s too complicated and she doesn’t understand a thing. She decides that the book is too hard for her to tackle and pulls up some kind of cockamamie Buffet quote that justifies her actions. She then realizes she has no money to start investing and pulls up another Buffet quote and decides to call Hina to borrow some money, but apparently, she was amazingly angry. Yukiji tries calling Hina again and somehow, she blurts out that Aika told her that she could get rich with stocks – which ends with Hina getting angry at Aika too. 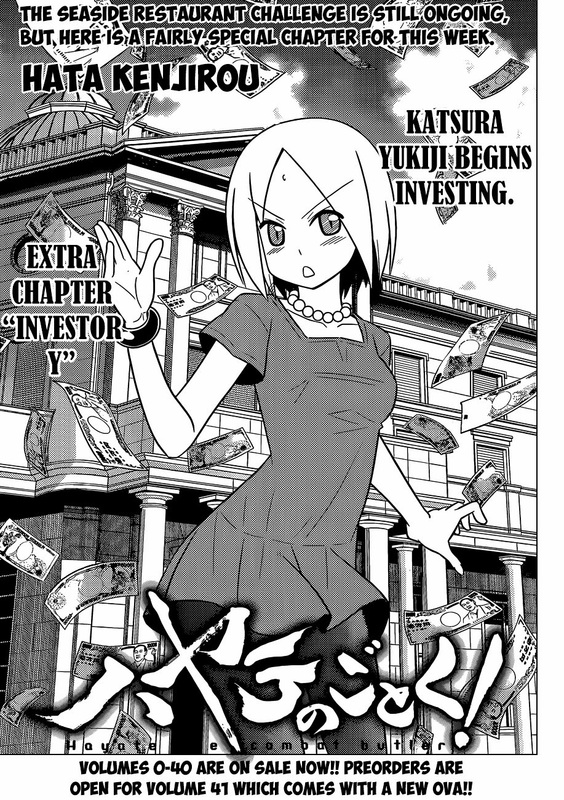 Left with no choice to start her investment scheme, Yukiji decides to get an advance on her salary and bonuses. So anyway, one more Buffet quote and she’s got some kind of get-rich plan going. So she looks for something that everyone will still want in 50 years… and this is how she ends up buying the lottery tickets… because everyone will still want to get rich even in 50 years time – brilliant! Review: Well… this chapter made me chuckle, but it obviously had nothing to do with the main plot. After all, this is the kind of manga you (we) are reading… nuff said. By the way... why do Yukiji and Ikusa have that same chakra thingy on their foreheads? Awright, so I’ve been meaning to write a Hatsune Miku post for the uninitiated for quite some time now, but I just really haven’t had a whole lot of free time to put my thoughts into words – until today that is. Ok, so let’s get down to the basics of Hatsune Miku. Most people have this misconception that Miku came from the Project Diva games for the PSP, which is a reasonable assumption (especially in the Philippines) since the PSP was and still is super popular here… but that’s wrong. See, Vocaloid 01 Hatsune Miku is simply the name for one of Yamaha’s voice synthesizer software from the vocaloid line. The Project Diva games on the PSP are simply spin-offs of the actual vocaloid software; people have been making songs with Hatsune Miku and other existing vocaloids long before the Project Diva games ever came into existence. You can wiki the more nitty-gritty details about Miku or read an explanation about her from a more musical perspective on this blog, but basically, what you need to know is that Miku originated from a type of music software developed by Yamaha that synthesizes voice. Her voice is not completely artificial since it is still generated using actual voice samples from the Japanese voice actress/singer, Saki Fujita (who doesn’t really sound like Miku when she sings). Think of Miku as something like a software-based keyboard synthesizer, except that you can make her sing virtually any lyrics that you want with vocal ranges that no human voice could ever compete with. 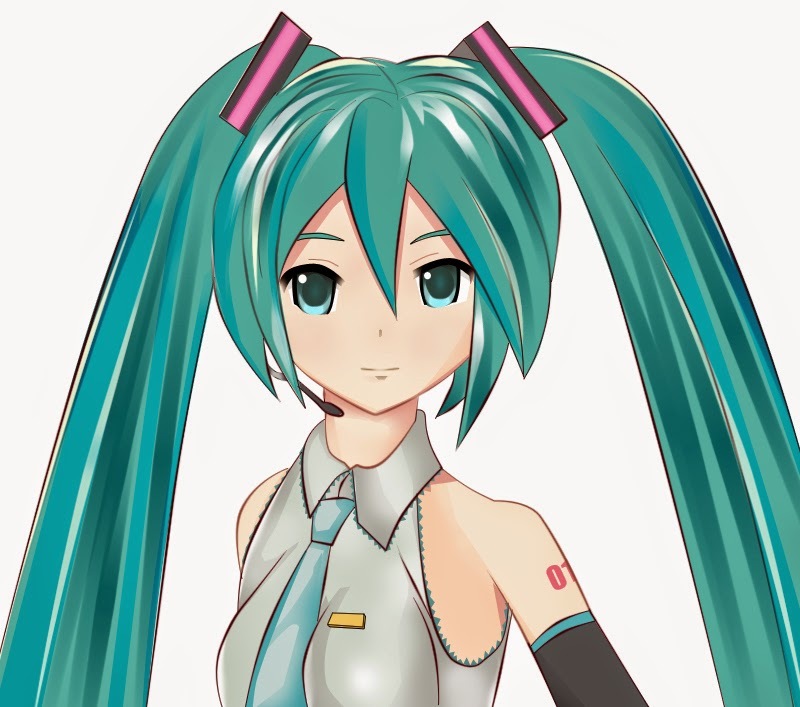 Miku’s official character art is that of a cute girl with aqua eyes, gigantic twin tails and her signature black/grey/teal costume consisting of two futuristic floating hair ribbons, two arm warmers with synthesizer buttons on them, glowing headphones with a microphone, a necktie with two clasps, a short pleated skirt, and thigh-high boots. Miku’s voice library has also been upgraded quite a few times since her initial release and with the right tuning, producers such as Mitchi-M can now make her sound almost indistinguishable from an actual human singer. So why is Miku the most popular one if there are other vocaloids as well? Well, the truth is that it’s because she was the one of the first to be packaged with an “image” so to speak and then some people from Japan’s answer to youtube, Nico Nico Douga took notice of her, and started making anime cover songs, original songs, artwork and promotional videos. This marked the start of the whole vocaloid phenomenon and before you know it, she’s appearing in Toyota commercials, her own video games, several collectible figures, posters, bags, and even doing sold out live concerts. Thus, more than just a virtual synthesizer, Hatsune Miku has become a true virtual idol – an ongoing musical phenomenon, who – although she may not be literally “alive,” lives in the hearts and souls of everyone who cosplays her, creates and/or listens to her music, or participates in the fandom in one way or another. I believe this song by KZ Livetune best summarizes just what Miku has become for her fans. 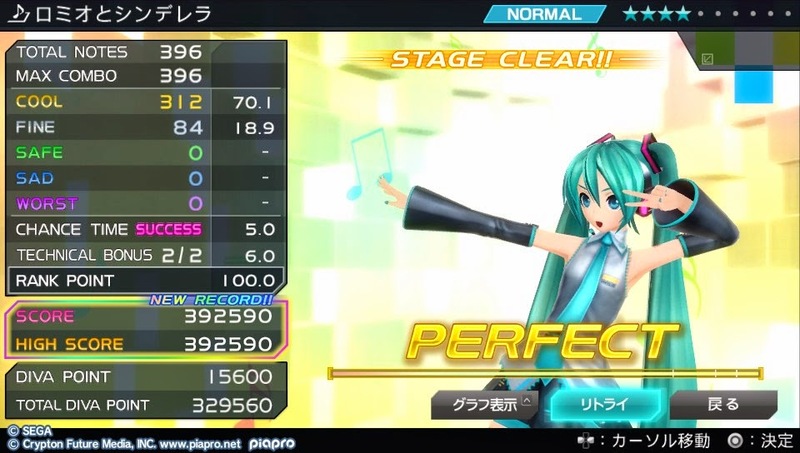 The opening theme of the PS Vita game, Hatsune Miku: Project Diva f composed by Ryo. If someone ever claims that vocaloid songs lack emotion, then this is the song to show them - enough said. While the song itself sounds pretty ok as is, it’s simply beautiful when paired with the amazing video created specifically for it. A real tear-jerker in a good way. The movie made for this song is all about childhood sweethearts who are forcefully separated by circumstances but are happily reunited. Basically a sappy love story in a music video done right. It’s like the happy ending to 5 Centimeters Per Second, if you’ve ever seen that movie. This song has a nice, catchy beat with a tune reminiscent of 16-bit videeo games. It depicts Miku and the other vocaloids going through a frustratingly hard rpg called Real Life using cute, 16-bit graphics. I like how the song tells a positive message about life: despite all the rpg-esque frustrations that we have to go through on a daily basis - somehow, everything is still worth it as long as you don't give up and keep on moving towards your own happy ending. I really like the instrumentals in this particular song even though the use of Miku's voice isn't that stellar. The graphics are probably done in flash and thus, they look quite crisp and cartoony when compared to Real Life Stupid Game. Miku has a perpetually angry face plastered on in this PV. The message of the song is pretty similar to the previous one, although a bit more vague. My favorite part of this PV is when Miku throws a hardball at Kaito with a satisfied evil grin on her face. This PV makes use of MMD (Miku Miku Dance) and uses the Lat Miku model. This is one PV that's not really worth mincing words on because quite simply, it's beautiful. Watch it now if you haven't seen this before - this is how MMD should be used. It's also a plus that the song is composed by one of my favorite Miku artists 40mP. He makes the best use of Miku's voice even before the Miku append versions were released. This song has a nice, gentle melody that fits in quite well with the cute, pastelly artwork used in the PV. It tells of a girl who forgot to say "thank you" to an older woman who always used to be there for her. Now that the older woman is gone, her only souvenir is her bittersweet tears of regret or somethin to that effect. Really lovely song that makes use of the low as well as high range of Miku's voice. A really uplifting Miku song by my other favorite Miku composer, Doriko. Nothing to see in the PV, really, but the song itself more than makes up for it. The lyrics kinda remind me of a really great short stoy called "Calling You" published in a light novel of the same name by Tokyopop. Another lovely song by Doriko. Tells the story of a young girl who is remniscing about her high school sweetheart who is no longer with her. A nice song in its own right, but it's pretty forgettable without the awesome custom PV that comes with it for Project Diva Extend. Some fans claim that this story is a continuation of from Y to Y. This comes from the same composer as Reboot. Worth a watch if you like tragic stories to go with your Miku songs. Reminds me a bit of Macross. This is another one of the more popular songs on my personal playlist. The song along with the PV look quite cute together, but it actually has a bittersweet ending. It tells a tale of Miku, who is an android traveling all throughout a dystopian world all alone in order to meet with her master or something to that effect. But... don't let me do all the talking. If you're fan of Miku and vocaloids in general, feel free to share your favorite songs with me in the comments.